The culture of Sado is commonly and broadly divided into three categories: "court culture in the Kuninaka area", "samurai warrior culture in Aikawa", and "townspeople culture in Ogi." 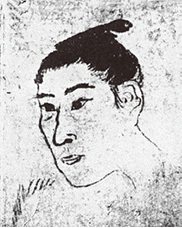 The culture of the Kuninaka area was fostered in the medieval times, when Sado was an island of exile, with cultural contributions of exiles from the then-capital city of Kyoto, such as Emperor Juntoku, Nichiren (Buddhist monk),?Hino Suketomo (court noble), and Zeami (Noh actor and playwright) , among others. From the Sengoku Period (around the 15th and 16th centuries) to early modern times, the gold mine, and the shift to a commodity driven economy brought about by the shipping industry, greatly transformed Sado, and that led to the formation of the city of Aikawa, which was then placed under the direct control of the gold mine, and the establishment of the town of Ogi as a port of call on a shipping route. 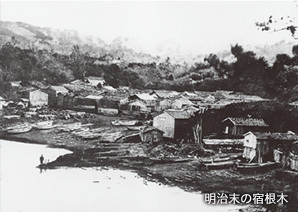 Prior to the development of townspeople culture in Ogi, shipping agents began living in Shukunegi around medieval times, and the village prospered, at the inlet there, to the extent that it was said to possess a third of the wealth of all of Sado. Later, after the Edo Shogunate developed Ogi Port, the major centre of commerce shifted from Shukunegi to Ogi. So, Shukunegi villagers set to sail out all around Japan and continue their trade in a group of a dozen shipmen with a ship owner as their captain. 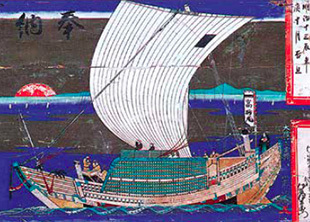 Shipbuilders and related craftsmen began living in Shukunegi, and the whole village developed and flourished as a base for the sengokubune (large wooden freight ship)?shipping industry. 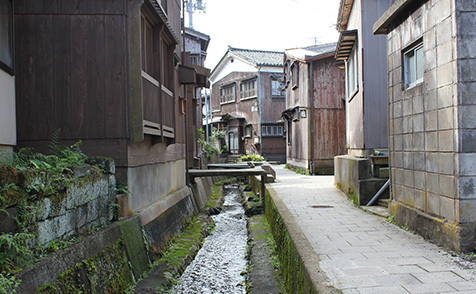 The village formed at the time remains as the rows of houses that can still be seen today in Shukunegi. Parallel with the Shokoji River that flows through the village, the houses stand side-by-side along the paths, with some alleyways leading to the sea. It is an area of high density, with 110 buildings built on about one hectare of land. 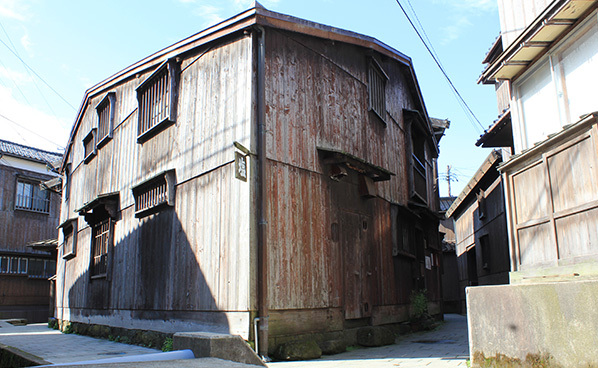 Some walls of these houses are made of planks and/or with nails of the ship, which are a reminder of the sengokubune. One of the main features of the Shukunegi village is the high density of the houses. Not only the main buildings of the houses, but also barns and storehouses, with thick mortar walls, stand together, and that reflects the prosperity and decline brought about by the shipping industry. It also reflects the conversion to agriculture, forestry and fishery from the shipping trade and the way villagers began working away from home. The rows of houses in Shukunegi maintain a simple and quiet appearance, but one step inside the house will reveal something spectacular. As with Seikuro's Residence (one of the private houses open to the public), beyond the side door is the spacious, comfortable entry area of packed earth, and the adjoining living room called "omae," commodious with a sunken hearth at the centre. Moreover, pillars, wooden doors, ceilings, and other points, lacquered in the tamenuri method (a thick lacquer coating) and glowing in dusky red, indicate the cultural accumulation and traces of everyday ingenuity, which cannot be referred to as simply a lavish livelihood. The original purpose of a village about to be forgotten, the value of a culture that cannot be abandoned (even though some may wish to do so), the house and the family bond that you wish to maintain eternally..... Once you enter the village, these thoughts slowly, and quietly, come to mind. 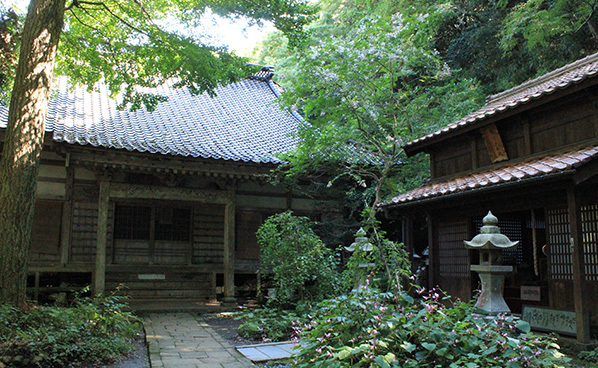 In old times, the architecture in Shukunegi used to consist of flat buildings. Later, the buildings started to be improved upon, rising to a full two stories in order to add a drawing room with tatami mat flooring, so that they could have more space to receive guests. An influential person, like a shipping agent, would first complete the transformation of his house, and then, other villagers?gradually began imitating the new style as it became popular. The styles of the houses reflect living conditions such as the location of the house on a narrow piece of land, and the proximity to the sea. In Shukunegi, as houses are packed close together in a narrow valley, most of the buildings are full two-story houses. The outer walls of the houses are made of vertically grained timber called tsutsumi-ita (literally: wrapping plank), so that it can protect against sea breezes blowing off the Sea of Japan. In contrast with the simple appearance of the outside, the interiors have elaborate designs with much lacquer coating. Twenty-six storehouses, some three-storied and with thick mortar walls, still remain in the village, and are mainly used for tool storage. Lacquered storehouses are all covered with Japanese cedar timber called saya, and most of them were built from the end of the Edo Period (1603-1867)? to the Meiji Period (1868-1912), when Shukunegi was prospering from the sengokubune shipping trade. 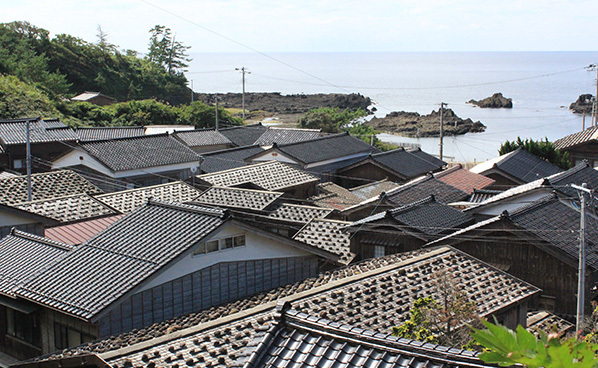 Roofs used to be shingled (kobabuki in Japanese) with stones on top, but Iwami tiles and Noto tiles for roofs were delivered to Shukunegi by freight ships in the Edo Period and from the late 1950s to early 1960s, respectively. Currently, about forty main buildings and barns have been restored to their original format of a roof with stones on top, and those make up another distinctive feature of Shukunegi's landscape. 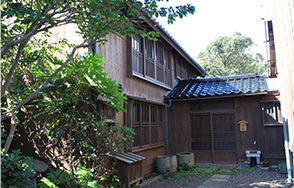 Buildings in the toridoma style (a house with a passage from the entrance to the rear side of the house), as seen in town, cannot be found in Shukunegi. In the Edo Period, the number of houses increased substantially, due to a rise in population, and they were forced to be built closer and closer. As a result, unique house plans started to appear, and so there is a mix of houses made by a variety of plans. 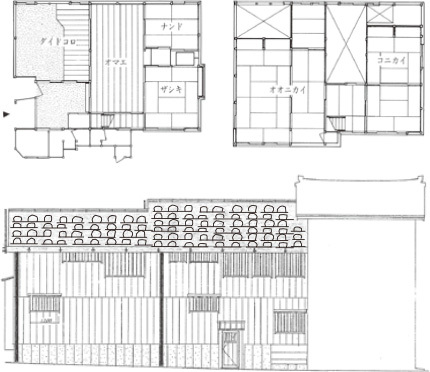 On the first floor, from the entrance, an entry area of packed earth (niwa), a kitchen (katte) , a living room with a sunken hearth (omae), a bedroom (nando), and a drawing room with tatami mats, are laid out. Above the living room, which usually has a two-story ceiling, the torinikai (corridor) connects two rooms called onikai (living/drawing room) and konikai (bed rooms) on the second floor. This style is influenced by that of the machiya? (traditional wooden townhouse). 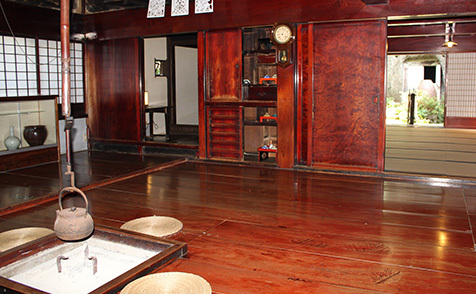 In the middle of the Edo Period, the onikai (drawing room with tatami mat flooring) was built on the second floor to entertain guests. Therefore, it can be seen how houses that were originally one-story houses, added second floors by extending extra pillars. Another architectural change was that, at first, the entrance and nando (bedroom) were set at the side, parallel to the ridge of the roof and the front part of the house, but eventually, the nando was moved to the back of the house and this new style was adopted to secure more private space. Buildings in Shukunegi are said to be constructed by shipbuilders, but most of the buildings were actually built by carpenters. Relocation, and the subdivision of land often took place, and, so, conversions from storehouses?into main buildings, and vice versa, were repeated because of a desire for better living conditions, such as more sunshine and securing a more comfortable space. The remaining traditional buildings are a testimony to the wits and ingenuity?developed by locals in Shukunegi, who lived in a narrow valley with high population densities. 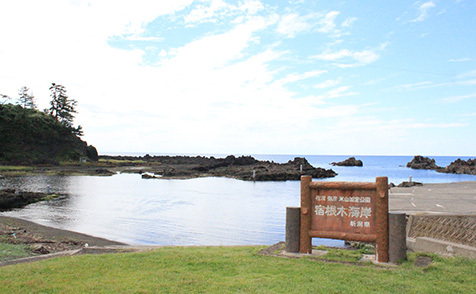 Shukunegi is a village that developed facing the sea. It is located approximately four kilometres to the south-west from Ogi Port, which was a port of call on the western shipping route. It prospered as a base for the shipping industry, on the Sea of Japan, from the middle of the Edo Period to the Meiji Period. The maritime shipping business at the time did not work in a direct way. An example of a direct shipping route would be if merchants delivered rice grown in Echigo (present Niigata) to Osaka in the west via the western shipping route. From there, they could then purchase salt and other commodities in Osaka, to sell in Hokkaido, in the north. By contrast, cargo ships of the time were private merchant ships (kaizumisen), which made stops at many ports along the route, and exploited the price difference in order to make a profit. At around that time, 500 people in 120 households lived in the community of Shukunegi, including a dozen shipowners, shipmen and shipbuilders. In addition, various shops and craftsmen such as a salted fish shop, a tub maker, a dye shop, a blacksmith, a stone mason, and others begin to gather there. The village developed as a base for shipbuilding, in addition to the shipping industry, and that formed the foundation of the rows of houses that can still be seen today. In Shukunegi, in addition to its characteristic, close-packed houses, there are two open spaces on the shore facing the sea and at the back of the valley. 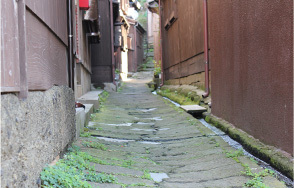 Almost all of the houses are built to make full use of the land on an alleyway called koji and the majority of the alleys lead to an open space, called Ohama, near the sea. Ohama was the place for unloading cargo from sengokubune freights, and shipbuilding, which served as a connection to far-away Hokkaido and Osaka for a long time. Another open space is located near the upper stream of Shokoji River, the river that flows through the hamlet, where Shukunegi Community Hall now stands. This area was a precinct of four temples, including Shokoji Temple's subordinate temples (matsuji) until the beginning of the Meiji Period, and later became the centre of the village where former Misakimura Village Office and an elementary school were built. It is now a recreational area, where villagers gather, and underpins locals' everyday life. Three areas, including Yachi (the two open spaces near the sea), Takayama, (a plateau), and Shukunegi Shinden, (on the heights a short distance away), combined to make a village that supported the passage of sengokubune. Since then, the land closest to the port became most highly valued, and the three areas were ranked in order of closest to furthest, which is Yachi, Takayama, and Shinden. Later on, in the last year of the Meiji Period, freight ships in Shukunegi gradually started to disappear, as steam ships and rails emerged, and telecommunication developed. Many people left the sea, dug horizontal wells and started to cultivate fields on the hill. Shipbuilders departed from Shukunegi, seeking other job opportunities, and Shukunegi became a village where inhabitants leave to work away from home. Now 180 people in sixty households live there quietly. The village has become primarily a farming and fishing community, but the prosperity of the good old days can still be felt across the village. Shuzo Shibata was born in Shukunegi in 1830. In his adolescence, he was sensitive to the fact that a turning point of history, that is, the end of the Edo Shogunate, was drawing near, so, he chose to go to Edo, with a strong desire to learn, and worked his way through school. 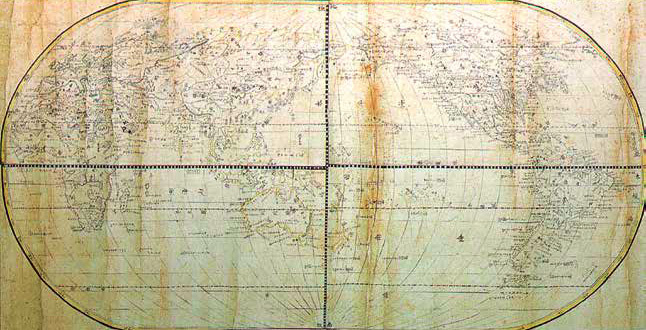 He mastered studies of the West through Rangaku (Dutch learning), medicine and astronomical geography. Later, Shuzo Shibata, holding samurai status, served the Tokugawa Shogunate as director in charge of mapping at Bansho Shirabesho (Institute for Western Studies), and was involved in almost the same duties as that of the present-day Geospatial Information Authority of Japan. His advanced attitude towards knowledge, with eyes wide open to the world despite the so-called "closed country" policy (keeping contact with foreign countries at a minimum), was respected and has made him a popular, pioneering figure of Shukunegi to this day. Chitochinton is a performing art dedicated to gods at the festival of the tutelary deity in Shukunegi (held on the second Saturday and Sunday in October). In the past, the freight ship of Shukunegi had to pass through a hazardous route near Tsunoshima Island, in Yamaguchi Prefecture. As a custom at the time of the first voyage, a young, first-time sailor dedicated a dance, to pray for safety, to Funadama Myojin (goddess of ships). Chitochinton reputedly originates from this dance. The performance consists of a dance by red and blue demons, an address to the goddess, and a dramatic interaction between a male role called Chitochin and a female role called Ton. There is also music played by bamboo flute, taiko drum, and hyoshigi (a clapping instrument made of wood). 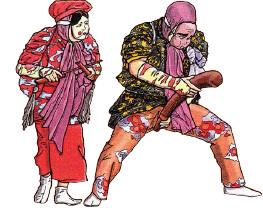 Present-day Chitochinton is based on the ancient narrative mask dance with distinctive sexual elements added, to casually liven up the festival.